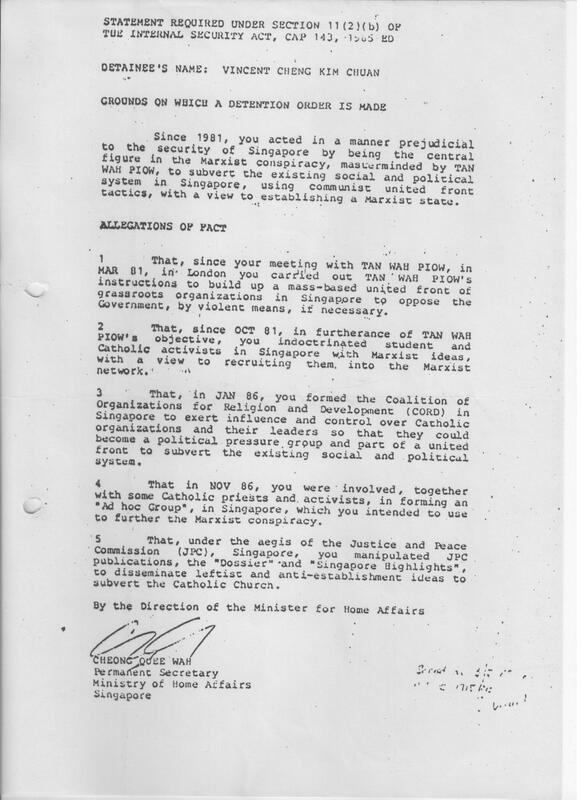 Operation Spectrum, also known as the 1987 “Marxist Conspiracy”, was the code name for a covert security operation that took place in Singapore on 21 May 1987. The 16 individuals were Vincent Cheng Kim Chuan, Teo Soh Lung, Kevin de Souza, Wong Souk Yee, Tang Lay Lee, Ng Bee Leng, Jenny Chin Lai Ching, Kenneth Tsang Chi Seng, Chung Lai Mei, Mah Lee Lin, Low Yit Leng, Tan Tee Seng, Teresa Lim Li Kok, Chia Boon Tai, Tay Hong Seng and William Yap Hon Ngian. On 20 June 1987, six more people were arrested, bringing the total number of detainees to 22. By December 1987, all the detainees had been released except for Cheng. In April 1988, nine of the released detainees issued a joint statement accusing the government of ill-treatment and torture while under detention. They also denied involvement in any conspiracy and alleged that they were pressured into making confessions. Eight of the nine were subsequently re-arrested and detained for a second time. They were eventually released after they signed statutory declarations denying everything they had said in their press statement. The truth of the allegations has been questioned. Historians C.M. Turnbull and Michael D. Barr have described the conspiracy as “myths” and a “fanciful narrative”, arguing that the arrests were politically motivated. Former Prime Minister Goh Chok Tong also revealed in his interviews for Men in White: The Untold Stories of the PAP that former National Development Minister S. Dhanabalan left the Cabinet in 1992 because he was not comfortable with the way the PAP had dealt with the 1987 Marxist conspiracy. “At that time, given the information, he was not fully comfortable with the action we took…he felt uncomfortable and thought there could be more of such episodes in future. So he thought since he was uncomfortable, he’d better leave the Cabinet. I respected him for his view,” Mr Goh had said. More recently, Mr Danabalan himself had also spoken out about Spectrum, following the death of former Prime Minister Lee Kuan Yew. “I wouldn’t venture to say whether he (Lee) was right or I was right. So it was not that he was ruthless, but that he saw dangers where I didn’t. Whether it was real danger or not remains to be seen,” he wrote in his tribute to Mr Lee, published in The Straits Times. The ruling People’s Action Party (PAP) government has continued to maintain its stand that the ex-detainees “were not detained for their political beliefs, but because they had involved themselves in subversive activities which posed a threat to national security.” A Parliamentary Speech by Home Affairs Minister Mr Teo Chee Hean in October 2011 continues to insist on the validity of the Marxist Conspiracy and the use of the Internal Security Act. Operation Spectrum also cascaded into many changes to the Singapore governance model, including the state’s relationship with the Catholic Church, and amendments to Singapore’s Constitution and the Internal Security Act to remove the power of the judiciary in cases related to internal security. The circumstances of Operation Spectrum and the Marxist Conspiracy continues to be rejected and debated by the former detainees. Many books have been published to shed light on the events of 1987. To commemorate 21 May 1987, Ethos Books is offering a 20% discount on selected titles it has published related to the ISA and Operation Spectrum. These are available for purchase at its online store. The offer ends on 31 May.